Christmas and the famed Christmas markets of Europe are storybook tales which stir the imagination of the mind to visions of fantasy lands. These dreams became reality when this Christmas our family took a trip to Austria to witness and experience firsthand the magic of the nativity told in traditional folklore and tinseled creations. We arrived in Munich on 23rd December 2018, our first stop on our 8 day journey. Our hotel was near to the Marienplatz the venue of the festive Christmas Market, with its ambience heralding Advent which marks the birth of Christ. Christmas trinkets and nativity scenes created the mood for a joyous festival. We had sweet roasted almonds as we walked along to help withstand the cold. Locals and tourists brushed each other buying Christmas gifts and enjoying culinary delicacies. Breakfast was at the café Rischart where we had a very engaging waitress eager to serve us. My husband Vasu relished the white sausage which he drowned with gulps of dark German Beer. The next day we rented a car and drove from Munich to Salzburg. It was Christmas Eve. 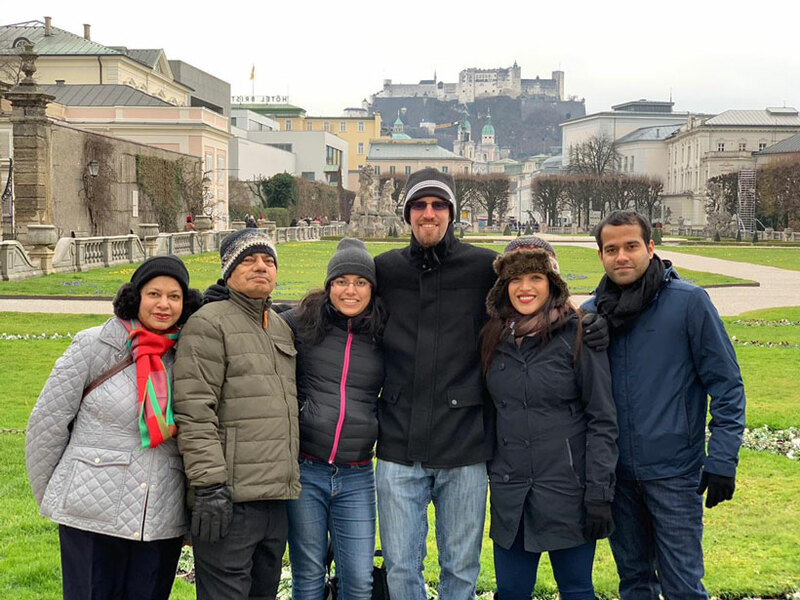 On our first day we walked around the streets of Salzburg taking in the scenes of churches and cobblestones and into the Mirabell Palace Gardens where the end part of the ‘Sound of Music’ song ‘Do-Re-Mi’ was filmed. We strolled through the smaller Christmas markets and munched sausages and sipped hot mulled wine in true German tradition. Munawira and Franav were already crazily shopping for souvenirs to carry memories back home. Christmas day was celebrated in Salzburg. Christmas cannot start without hearing Christmas mass. So the family walked to the Franciscan Church, one of the oldest churches in Salzburg. The mass was sung in opera style and the whole atmosphere radiated a tranquil peace. At the end of the mass, the lights went off for the hymn ‘Silent Night’ to be sung. While the choir and the congregation lilted to the tune of this immortal song, I tried to capture the beauty of those moments by turning my phone video on. The lights from the phone made people turn around in silent indignation. The shutting off of the lights in the church was symbolically meant to match the Silent Night lyrics and here was a tourist intruder trying to disrupt the serenity of the atmosphere. My daughter Minerva glared at me and I hastily shut my phone. My son-in-law Bram later told me that the original ‘Silent Night’ carol was composed in Salzburg, Austria with the lyrics and music written and composed by Austrians Joseph Mohr and Franz Xaver Gruber. I now fully understood the church goers displeasure at my intrusion. Later we followed the footsteps of the Von Trapp family of the ‘Sound of Music’ fame, munching honey toasted almonds. The famous Christkindzl Markt located at the famous Cathedral Square was abuzz with tourists drinking their famous mulled wine-a spiced alcoholic drink served hot. Gulps of the mulled wine warmed the cockles of our insides as we walked down the Christmas markets with shops selling delectable food, glittering tinsel decorations and local wear. The lighted decorated streets crisscrossing the sky added to the phenomenal starry glitter. The fairytale Christmas spirit enveloped the air in the merry making and revelry of the people milling there. It was truly a joyous and a merry Christmas. The next day we headed for Hallstat, known as the pearl of the Lake District a town nestled between the Hallstatter Lake and the Dachstein mountains. Bram drove the nine seater van from Salzburg through the scenic breathtaking landscape of the Wolfgangsee to the Hotel Romantik Seevilla in Altaussee. The hotel was a favorite of the German Composer Johannes Brahms and two of his compositions were premiered here. The hotel had spectacular views. The golden glow of the snow capped mountains reflected in the waters of the Altaussee lake was a dazzling spectacle and the mirage like image on the crystal glass lake left a mesmerizing effect on the senses. It was here at the Hotel Romantik Seevilla that we had our first four course meal of the trip which made the gourmets in the group happy. While we sipped our wine and enjoyed the meal, a live orchestra delighted our senses with their music. The following day we went to Hallstat. We took the furnicular to the Skywalk to Welterbeblick which offered magnificent views of the entire Dachstein Salzkamergut region and sipped warm chocolate in the ‘Rudolfsturm restaurant’ which was the only restaurant on the top of the mountain.The famous Hallstat salt mines are located in the region. Though they were closed for the winter, Vasu bought 2.5 kg of salt from the salt mine gift shop. They were salt rocks from different mountains of the world. Vasu has this crazy passion of buying unusual souvenirs which land up on display at one of his International schools. The fairytale town of Hallstatt is a world heritage region. We walked by the lake across Hallstatt’s delightful homes built into the mountains and rambled along its narrow cobbled streets and had lunch at one of their lakeshore restaurants. I criticized Mini for not being the best photographer, but when it came to jotting down this travelogue, I realized that her pictures gave me insights into vivid descriptions of this Alpine beauty called Hallstatt. The final destination was Innsbruck. Here we stayed at the Vitalhotel Kaiserhorf which was in the picturesque village of Seeweld. We took the remarkable Northkette Cable Railways combo to the top of Innsbruck which is called the ‘jewel of the Alps’. The panaromic views were breathtaking, but people who walked to the top kept slipping on the ice on their way down. Not risking a fall both Franav and Mini chose to slide down the snow on their bottoms while Priam and Bram walked down with cautious steps. The last stop that evening was to the Swarovski CrystaL Worlds. It is a museum of contemporary art, nature attractions and interesting history. Internationally and nationally acclaimed artists, designers and architects have crafted crystal into various forms making it into one of the most popular tourist destinations in Austria. The day ended with a delicious meal at a Thai Restaurant. Austria has left a deep imprint in my mind. The land of Mozart and the ‘Sound of Music’. I had visited Vienna in 2016 with Vasu, but missed the opportunity of visiting Salzburg. In my heart I was disappointed, but God has his own plans and this time I got to see the rest of Austria with the whole family. We missed Mabel, Logan and Athena who were in Los Angeles, Athena being just two months old would not be able to travel. Missed my lovable Leo (Mini’s pup) but he was well looked after by a dog sitter in his home in Redwood City California. I had to jot down this travelogue before my next travel experience. For tourists who are looking out for holiday destinations during the Christmas season, Austria brings out the wonder of Christ’s birth in manifold ways.